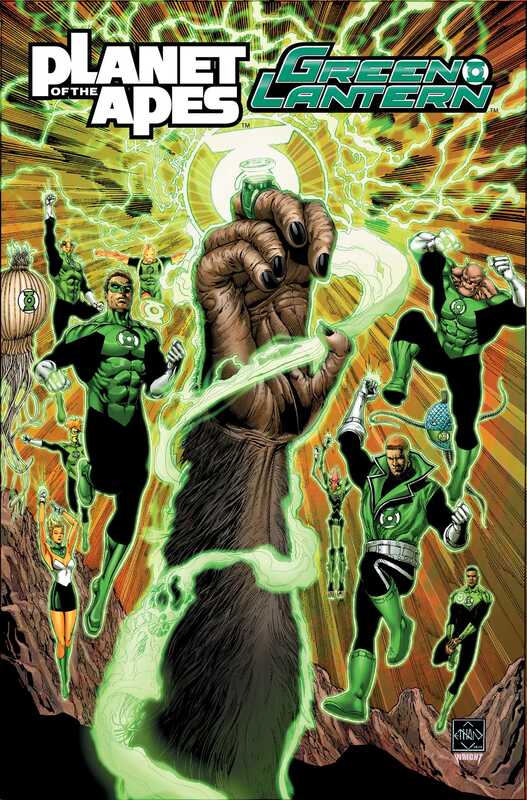 When Cornelius discovers an all powerful ring in the Forbidden Zone, the Planet of the Apes becomes a battleground for its secrets, thrusting the Green Lantern Corps, Sinestro Corps, Red Lanterns, and more into a war they will never forget. Cornelius discovers an ancient ring in the Forbidden Zone and unlocks a power that echoes across universes. With the Green Lantern Corps, led by Hal Jordan, racing to get to the source of this power before Sinestro can get his hands on it, they will discover a truth about the Guardians that will change them forever on…THE PLANET OF THE APES. From writer Robbie Thompson (Silk; Spidey; Supernatural), Justin Jordan (GreenLantern: NewGuardians, LutherStrode) and artist Barnaby Bagenda (OmegaMen) comes the war of the Green Lanterns on the Planet of the Apes!